Good conveyancing can be cheap…You just have to know where to look. Unfortunately many estate agents still recommend property lawyers not on merit, but on the size of their referral fee (£600 is not unheard of – you pay for that by the way)! So if you want to cut the cost of your conveyancing bill, online is where you’ll find the best deals. To help steer you towards the ‘best of the net’, we’ve written reviews of the online conveyancing services we use, and rely on daily. Are our recommendation respected and any good? Conveyancing quotes: A word of warning! 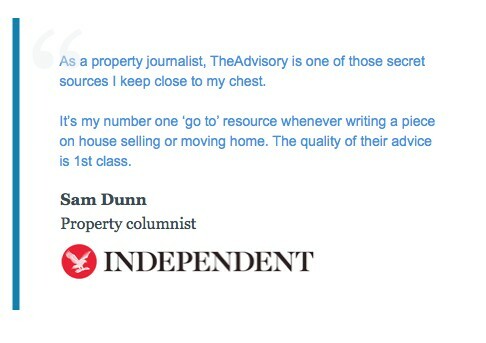 As you know, here at TheAdvisory we never recommend any service we’ve not first used ourselves. We’ve thoroughly tested these conveyancers and placed 17 of our own transactions with them in the last 12 months. Despite initial worries about the quotes being a little too good to be true, I’m happy to report that the whole team here at TheAdvisory are total converts. It seems that the ‘conveyancing bar’ has been raised and finally the public can expect great service at an extremely low price. Apart from one minor hiccup (which I must stress was NOT the fault of the solicitor at ConveyQuote), all 17 of our transactions completed on time and with a fair amount of good humour – Virtually unheard of from a conveyancer!.. Especially ones that offer their services at such competitive rates. What’s so good about ConveyQuote? The website provides fast and accurate conveyancing quotes on a no move, no fee basis. And unlike most conveyancing services (at the cheaper end of the scale), with ConveyQuote you get a dedicated (and highly experienced) conveyancer as your single point. This saves you from the frustration of being passed around different team members (that do not know your case intimately) every time you call up for an update or advice. This level of personal service is virtually unheard of at this price point. If you find a cheaper conveyancing quote anywhere on the web you should be extremely sceptical as to how genuine it is. Our research shows many websites provide inaccurate (and misleading) quotes. These misleading quotes are made to look cheap in order to trick inexperienced home movers into signing up with an aggressive firm. This website is run by well establish (and multi award winning) Licensed Conveyancers with a proven track record and excellent service record. The conveyancers behind the website are fully regulated by The Council for Licensed Conveyancers and as such bound by strict rules regarding service standards and consumer protection. Basically they’re exactly the same as Solicitors except that the only area of law they deal with is property conveyancing. In my opinion, Licensed Conveyancers actually provide a better service compared to multi discipline solicitors. This is because from the top of the firm to the bottom, all they’re concerned with is providing the best conveyancing service possible. If you want to save as much money as possible on conveyancing (without compromising on the quality of service you receive), the team at ConveyQuote are definitely worth talking to. CompareAndConvey are the UK’s original conveyancing price comparison site. A favourite of the IFA industry and recommended by many house builders looking to make sure their buyers have a smooth move. They’re the safe choice if you want to guarantee you get a slick & highly personal level of service. You’ll find many imitators advertising on Google but none have the same quality of conveyancers on offer. They all provide quick & reliable conveyancing services. And they’re all proper solicitor firms or licensed conveyancers. All these top quality conveyancers quote ‘discounted fixed fees’ on ‘NO completion – NO legal fee’ basis (backed by genuine service level guarantees). Well, because CompareAndConvey generates such a large, steady and reliable volume of business – economies of scale allow the solicitors they work with to reduce their operating costs and offer you their services at the cheapest price possible. You will pay a substantially cheaper price by instructing a solicitor through the CompareAndConvey website compared to going direct to that same solicitor. It is a mixed blessing that the Internet has turned conveyancing in to such a competitive industry. On the one hand it has forced down prices but on the other, it has led to most solicitors having to cheat in order to survive. …So keep your eyes peeled for those tempting £199 conveyancing adverts – Sadly, they are too good to be true. On the other hand, with CompareAndConvey, the price they quote is the price you pay. We regularly mystery shop the UK’s top 100 conveyancing services and always find the quotes on CompareAndConvey to be fully itemised, 100% accurate and simple to understand. CompareAndConvey is one of the few places where the online quote matches the solicitor’s final bill. 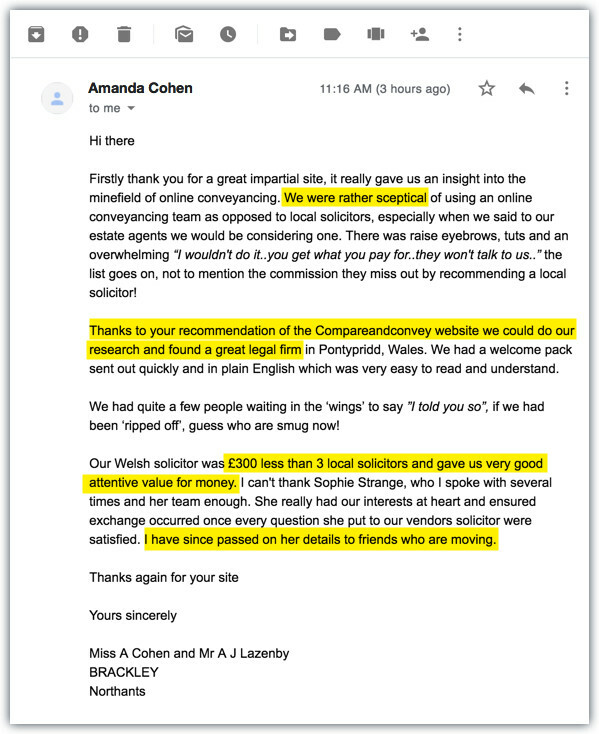 For added peace of mind, you can even read live unedited client reviews for each solicitor from within the CompareAndConvey website. To make your transaction as stress-free as possible, and to avoid costly conveyancing mistakes, the CompareAndConvey service is highly recommended and one I personally use (and rely on) regularly. CompareAndConvey: Get fast online quotes here! It’s scandalous how many solicitors are out to con you by providing quotes that require a degree in Legal Forensics to enable you to uncover the numerous (and hefty) hidden extras they contain. Hi, I’m so glad I found this website. I was suffering from analysis paralysis and now I know where to find a fair deal. Dear Advisory team. Thank you for being a constant source of sound advice during our recent home move. When it came time to choose a solicitor we naturally came back once more to see if you had any recommendations. So glad we did as the local solicitor our estate agent wanted us to use was an eye-watering £450 more expensive. Instead we chose Baker Ashley from the comparison site you recommend and Sophie our solicitor could not have been more helpful or efficient. She really went the extra mile for us dealing with some rather tricky buyers. We are now happily settled in Dorset and would recommend her without hesitation.